Easy Lemon BarsIf you enjoy lemony treats as much as I do, you’ll love this Italian Limoncello Recipe. Italians consume Limoncello as an after-dinner digestive, while the rest of us appreciate the intense lemony flavor with a surprising kick! A while back I shared some exciting news that I had received from Ancestry. My results showed that I was 15% Italian-Greek. 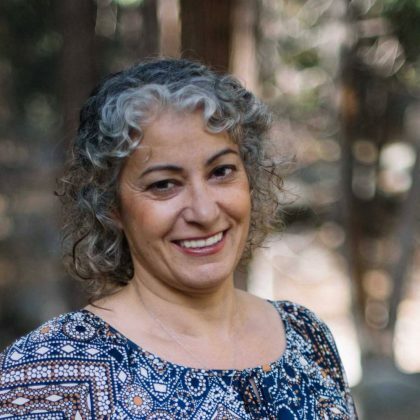 This was exciting news because I’ve always thought I was 100% Assyrian. I dreamed of all the Italian and Greek dishes I wanted to explore. This list of courses included Limoncello. Since then they’ve updated my profile to show that in fact, I am neither Greek nor Italian. 😔 Although this was disappointing news, I’m not letting it keep me for exploring new recipes, like this Italian Limoncello Recipe! 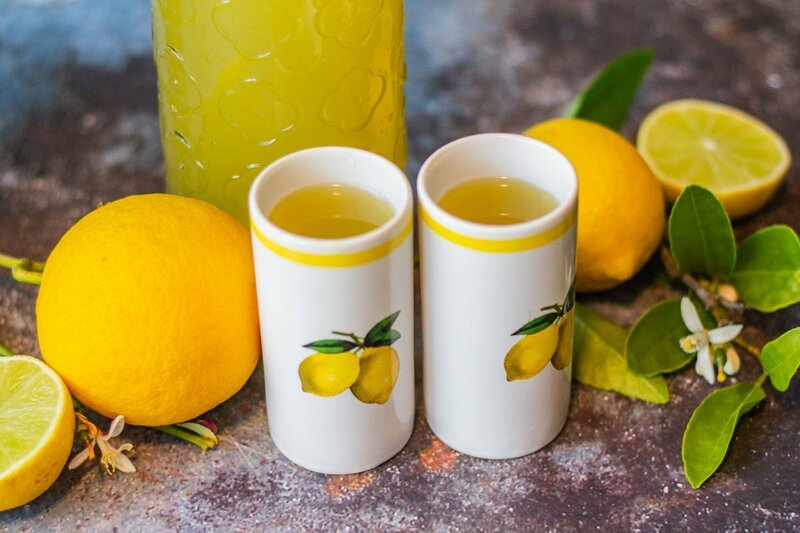 Limoncello is a lemon-infused Italian liqueur. It is served in chilled shot glasses, usually after a good meal. Limoncello is normally stored in the freezer. 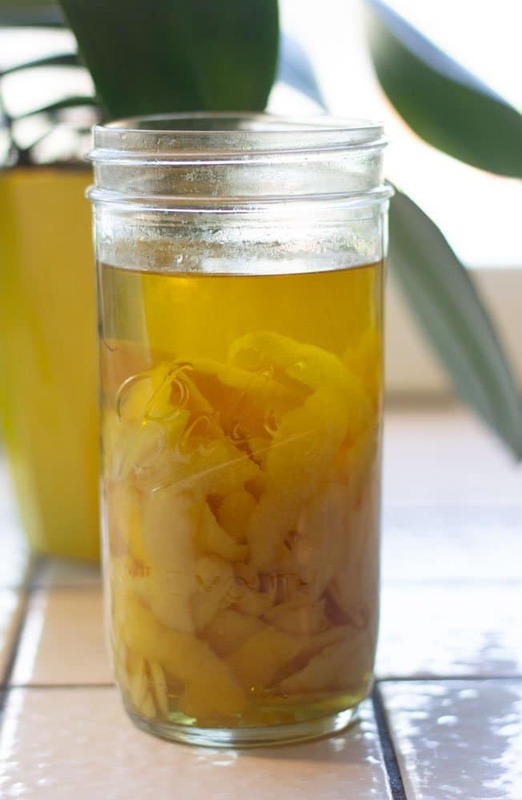 Limoncello is easy to make at home! Although I’ve tasted limoncello in Italy, I don’t pretend to be an expert on the subject. In preparation for this Italian Limoncello Recipe, I watched many Youtube videos on the subject. 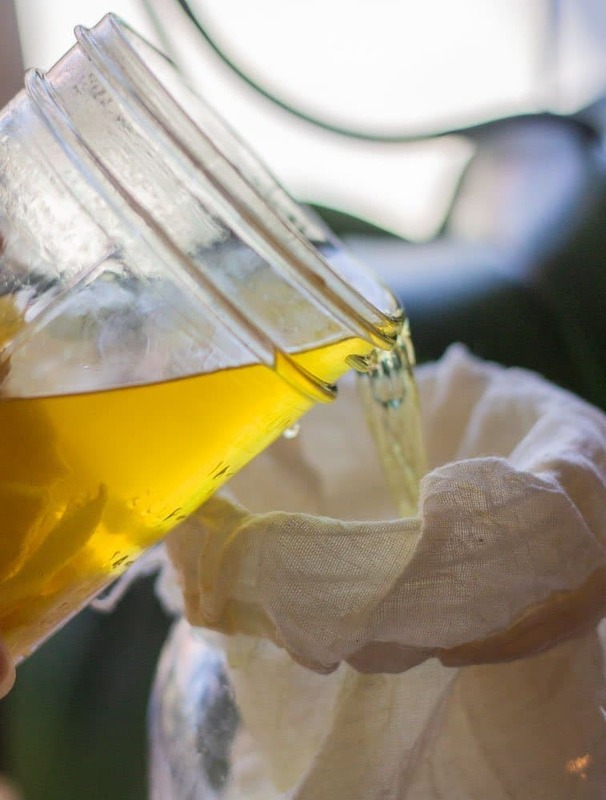 I quickly discovered that unlike some recipes that generally have a similar process to prepare, that is not the case with Limoncello. The ratio of alcohol to water, sugar, and lemons varied greatly! As an example, the alcohol content was anywhere from 1-1/4 cups to as much as 4 cups. Although most of the recipes included a simple syrup, some just stirred the sugar in with the alcohol, while others used honey. I even found some recipes that add lemon juice instead of water. As usual, I let my instinct be my guide in deciding on the ingredients and proportions to use. 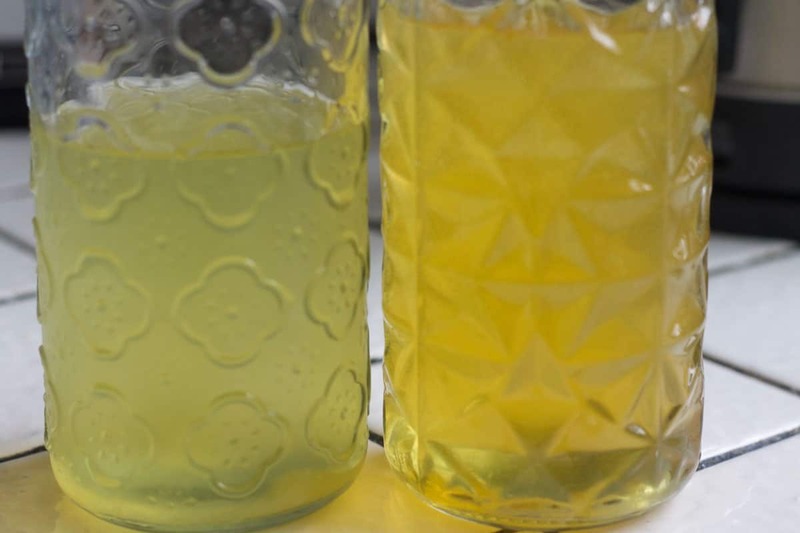 The limoncello on the left was made with gin, the one on the right had an additional 1/2 cup of lemon juice added. If possible, don’t use store-bought lemons since they are usually coated with wax and pesticides. However, if you don’t have access to homegrown lemons like some of us do, make sure to dip the lemons in hot water for a few seconds to melt the wax off. 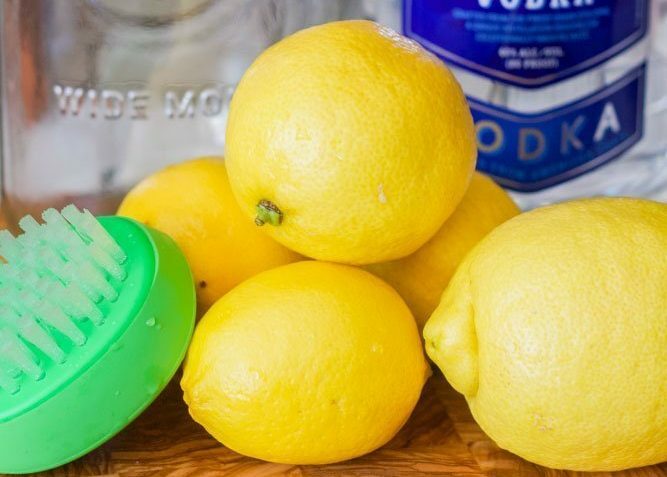 On the other hand, if you’re lucky enough to have access to home-grown lemons, make sure to scrub them with a Vegetable Brush to remove any dirt or residue. 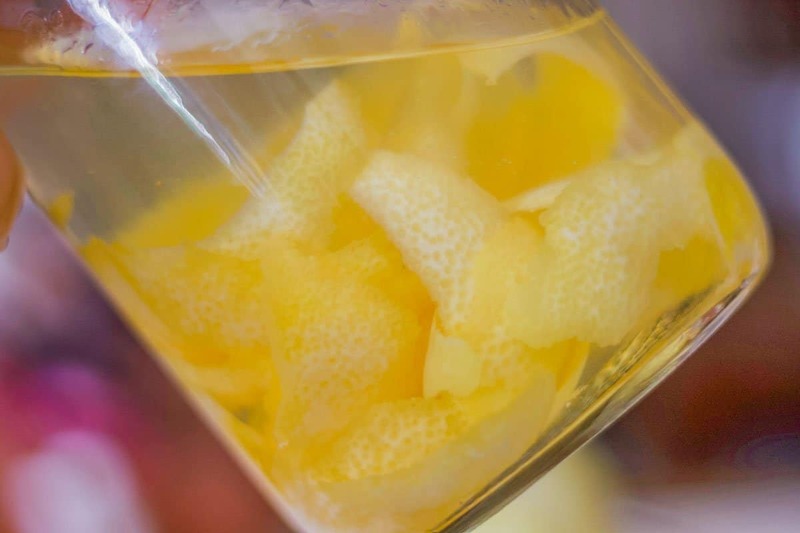 Thick skinned lemons, such as “Eureka” lemons, are best for making limoncello. Using a Vegetable Peeler to peel the lemons works great. “Meyer” lemons, on the other hand, have thin-skin, and almost impossible to peel. Be sure to thoroughly clean the lemons before peeling. What Alcohol is Used to Make Limoncello? 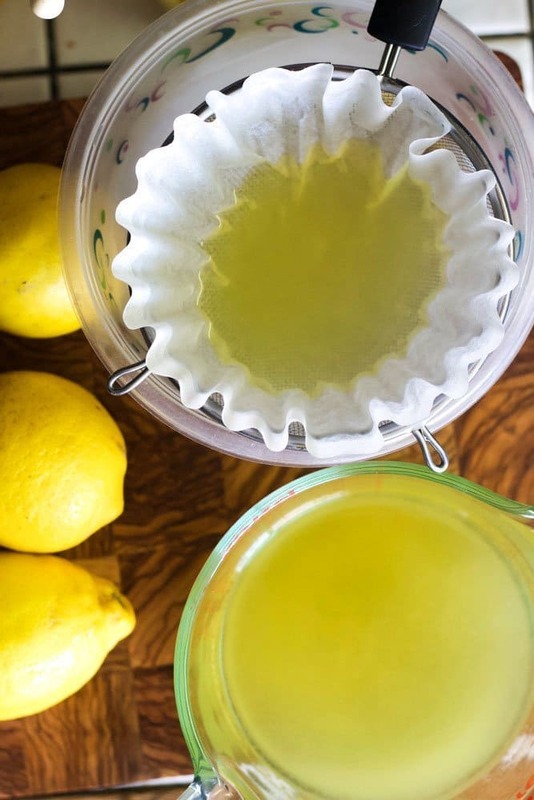 How Long Should You Steep the Lemons for Limoncello? I was surprised by the variation in steeping length in the recipes I found. Some called for as little as three days, some as much as 3 months, with a majority recommending 14 to 30 days. Due to the variations in steeping time, I decided to test out the difference between limoncello steeped for 2 weeks versus 30 days. I also made a batch with added lemon juice and one without to see which was better. There was a small difference in flavor between the batches steeped for 2 weeks versus 30 days. However, I definitely preferred the flavor of the limoncello that had the additional 1/3 cup of lemon juice. While doing my experimental batches for this Italian Limoncello Recipe, I tried various methods of straining my lemon-infused alcohol. With my first attempt, I used a strainer. This left the Limoncello with small lemon particles floating in it. Since I didn’t have cheesecloth on hand (I think it’s somewhere in my Montana kitchen), I used a cotton napkin. It created a big mess, I don’t recommend it! I also tried coffee filters, but the liquid just sat there and didn’t strain through the coffee filter. Finally, I got on Amazon and ordered these reusable Soup Bags; they are so amazing! I just lined the inside of a large mason jar with one of the bags and poured the contents of the alcohol steeped lemon peels in. This also makes it easier to squeeze the last of the liquid and flavor out of the peels. So do yourself a favor, learn from my trial and error, and get yourself some of these bags! Using a coffee filter to strain the limoncello was an epic fail. The liquid would not strain through the filter. 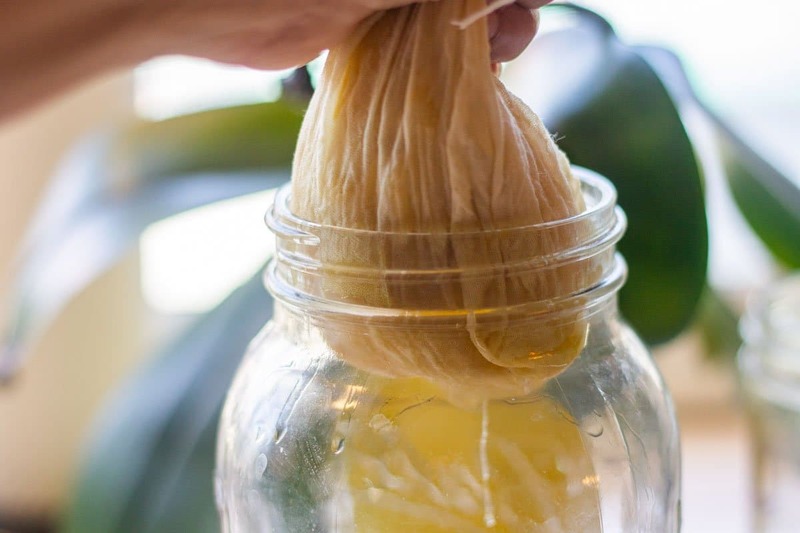 Soup bags are perfect for straining the lemon-infused alcohol. 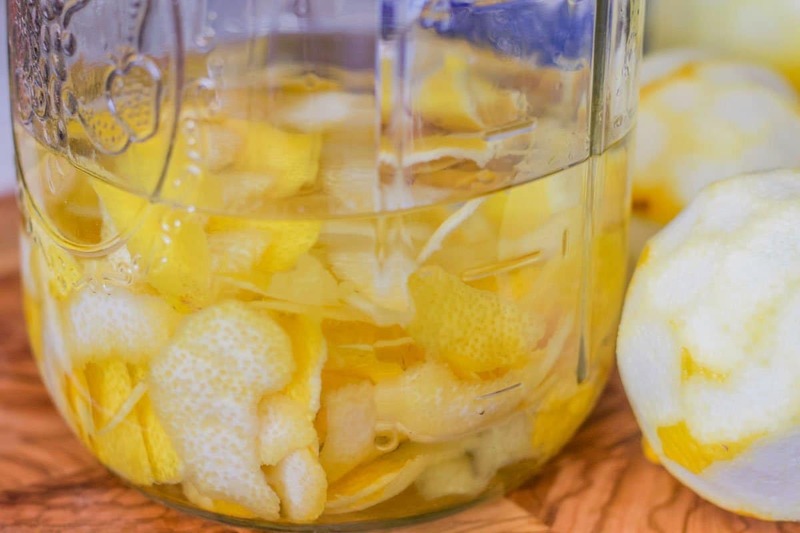 Use a potato peeler to peel the lemons, making sure to only get the outer peel, then add to a large mason jar. Pour two cups of Everclear over the lemon peels. Add the lemon juice, then seal the jar. During the next two weeks to 30 days, store in a dark place and shake to agitate every few days. When the appropriate time has elapsed, strain the alcohol into a clean bottle. 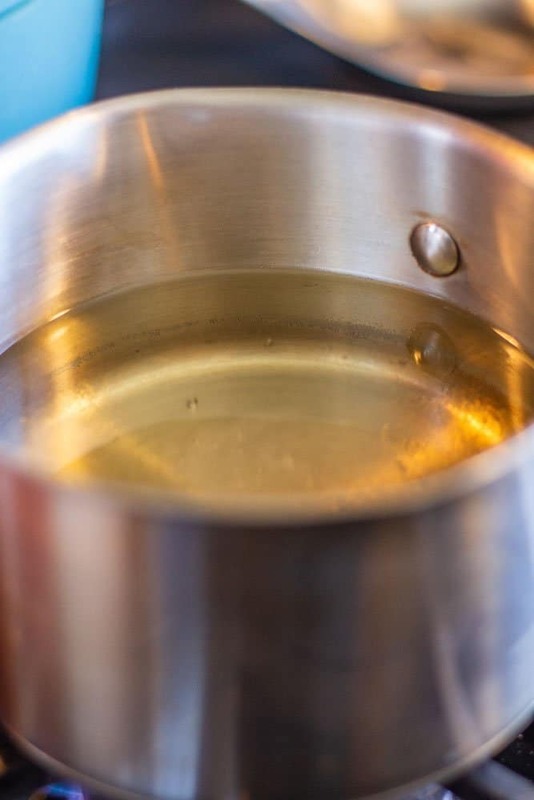 Add water and sugar to a small saucepan and stir to combine. Bring to a boil until the sugar dissolves, then cool. Mix syrup with strained alcohol to combine. Store in the freezer, or the refrigerator. Drink Responsibly! 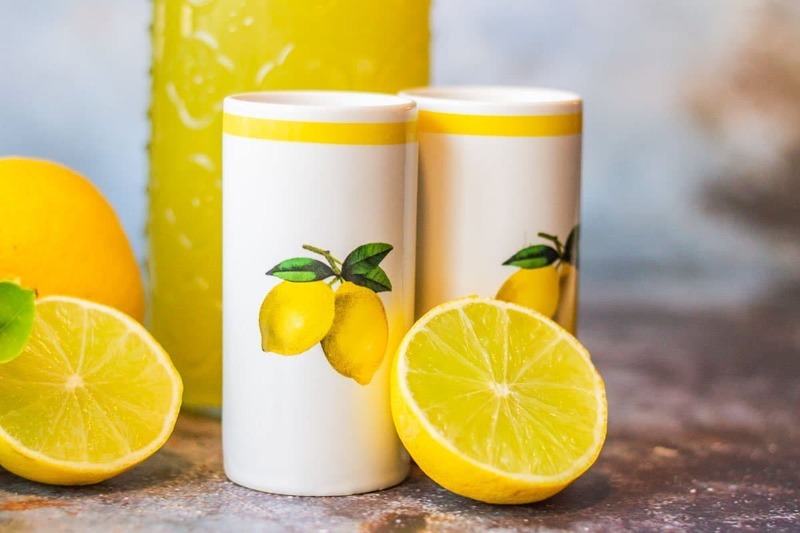 For other lemony recipes, check out the following posts: Easy Lemon Bars, Moroccan Preserved Lemons, Easy Lemonade. For more information, check out this great article called Who Invented Limoncello, Italy’s Famous Lemon Liqueur. Tasty, Italian after-dinner drink, with a lemony punch. Use a potato peeler to peel the lemons, making sure to only get the outer peel. 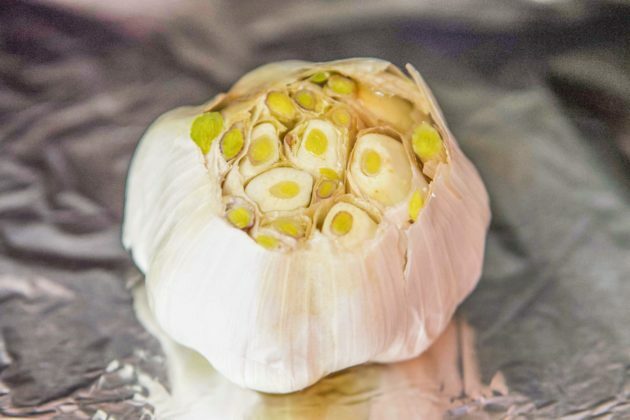 The white part will impart a bitter flavor. 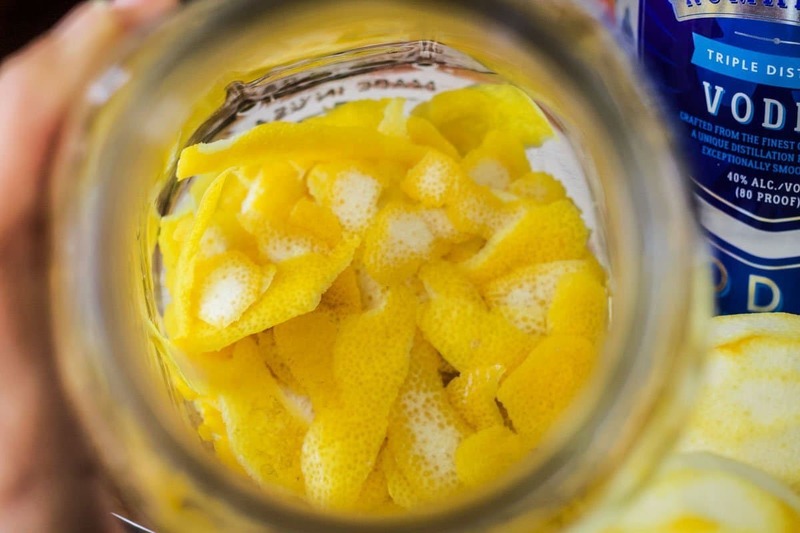 Add the lemon peels into a large mason jar. 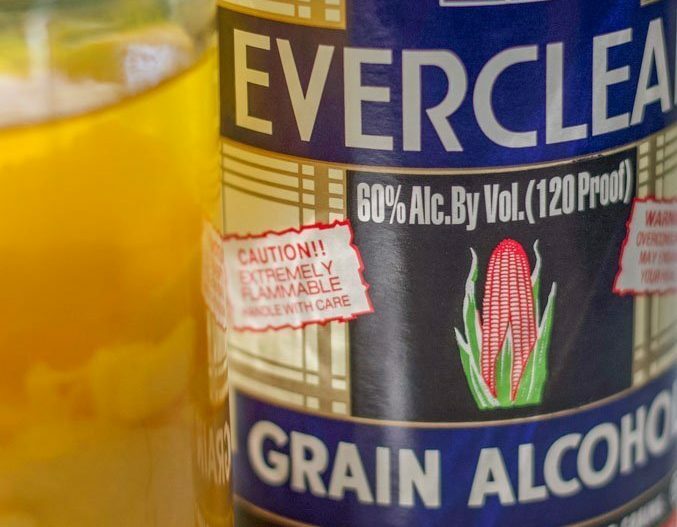 Pour two cups of Everclear over the lemon peels. Add lemon juice, then seal the jar. I like to write the date either on the lid, on the bottle, or the calendar. This way I know when to proceed with the next steps. During the next two weeks to 30 days, store the bottle in a dark place. Shake to agitate every few days, or whenever you remember. 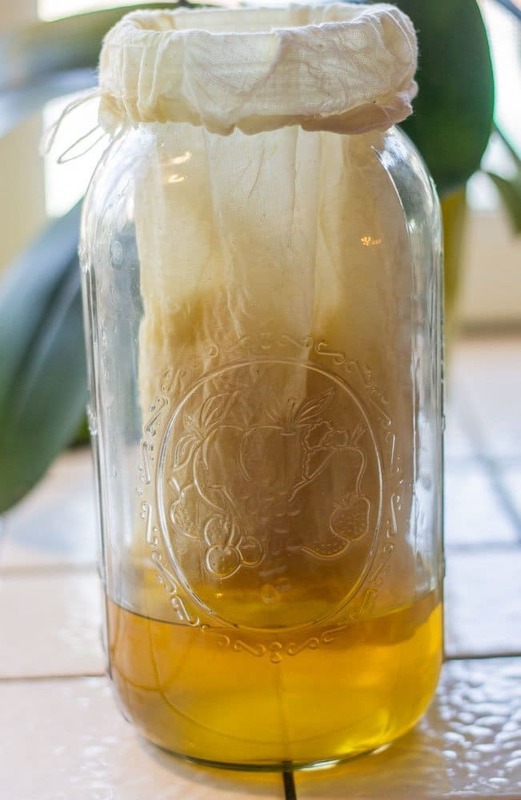 When the appropriate time has elapsed, strain the alcohol into a clean bottle, using cheesecloth soup bags. Add water and sugar to a small saucepan, and stir. Bring to a boil until the sugar is dissolved, then cool. Mix cooled syrup with strained alcohol to combine. Store in the refrigerator or freezer, and drink responsibly! Thanks, Cheryl. I did read somewhere that you can use other sugar-free sweeteners. Let me know when you need taste-testers! Also, the bags are handy for so many things! I’m planning on using them to make yogurt cheese too! That is a fascinating recipe Hilda! I may try it with a sugar-free alternative so it would work with my diet to remain sugar-free, Thank you! I think the soup bags would come in handy for making bone broth also.